As the weather gets hot, let’s look at a catalog to encourage thoughts of something a bit cooler in temperature. Perhaps a trade catalog related to soda fountains? Previously, we highlighted New Catalog of Cold Soda Requisites by American Soda Fountain Co. which is a catalog from 1904. We focused on the dishes, tools, tables, and chairs of soda fountains shown in that catalog. Those are all essential items. This time, we will look at soda fountain counters. Another catalog in the Trade Literature Collection shows us that very thing. 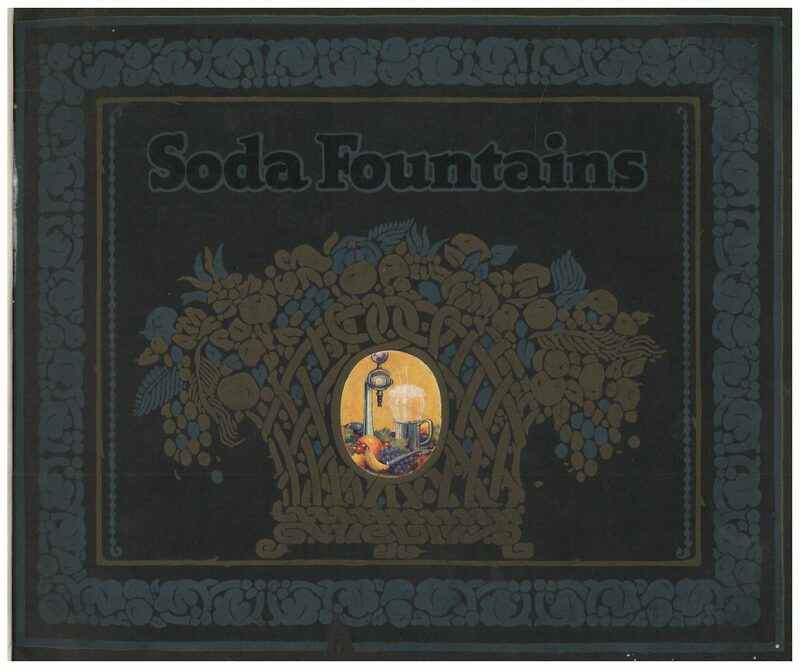 It is from 1920 and is titled Soda Fountains by Fountain Specialty Co. It is full of many colorful illustrations of soda fountain counters and backbars. Some appear more ornamental while others take a simpler look. Because of the varying amounts of available space in stores, they also came in different lengths. Fountain Specialty Co., Chicago, IL. Soda Fountains, 1920, front cover. Fountain Specialty Co., Chicago, IL. Soda Fountains, 1920, title page. One of these designs is called the Omaha. The counter was 42 inches high and made from white Italian marble except for the basing, frieze, and pilasters which were made from Verde Antique marble. On the wooden backbar, there were two display cabinets on either end with art-glass doors. This seems to add to the whole effect, giving it a comfortable appearance pleasing to the eye. The cabinets had Vitrolite backs and wood shelves to display dishes, cups, and other items. A large mirror was located between the two display cabinets and suspended in front of the mirror were three iridescent electroliers. Fountain Specialty Co., Chicago, IL. 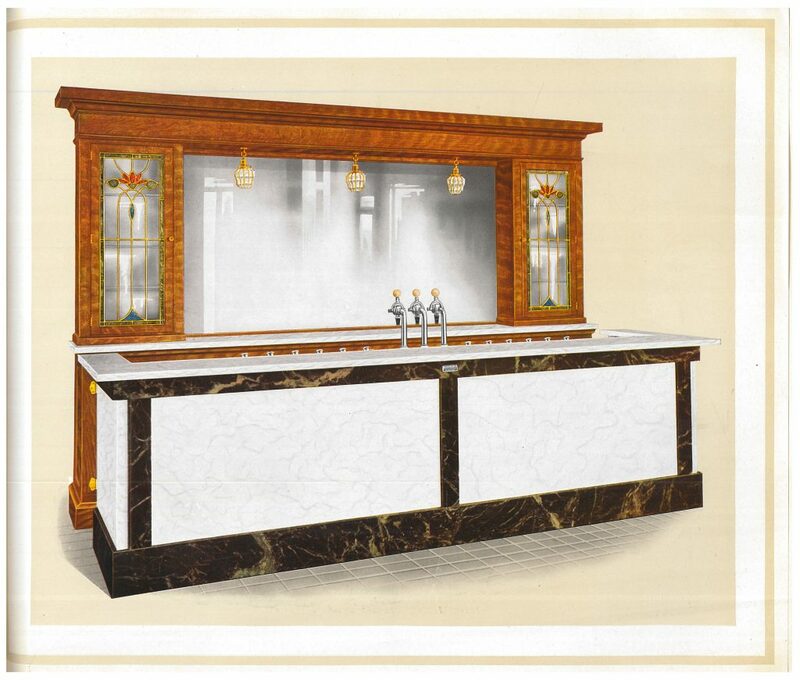 Soda Fountains, 1920, page 33, Omaha Design Soda Fountain Counter and Backbar. Another design shown in this catalog is the Madison. This option combined function with attractiveness. Also a 42 inch high counter, it was made from Tennessee marble. The frieze and basing were manufactured of a dark cedar-colored Tennessee marble while the front, sides, and top were made of a lighter Tennessee marble. The backbar was available in birch wood or oak with cabinets for storage and display of dishes. It fit well in a store that had space for a counter eight or ten feet in length. Fountain Specialty Co., Chicago, IL. 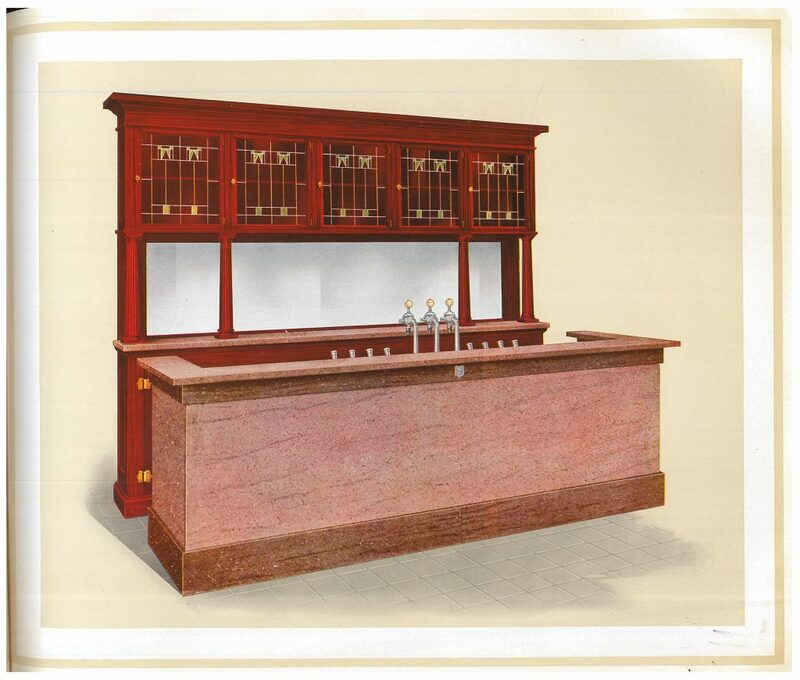 Soda Fountains, 1920, page 37, Madison Design Soda Fountain Counter and Backbar. What about the working area behind the counter? How did the area for the storage of ice cream, syrup, and other ingredients look? Several options for interiors of counters are also illustrated. The choice of an interior depended on the length of the counter and the desired equipment. This counter interior shown below, labeled Interior No. 833, fit well with an eight foot counter. Perhaps it might have worked with the Madison counter. Features included space for two 5-gallon ice cream cabinets, eight syrup pumps with a nearby chipped ice compartment, and three fruit jars in the creamer section. There were also several other features including a refrigerator compartment, water basin, and swinging faucet. The equipment could be arranged in various ways. 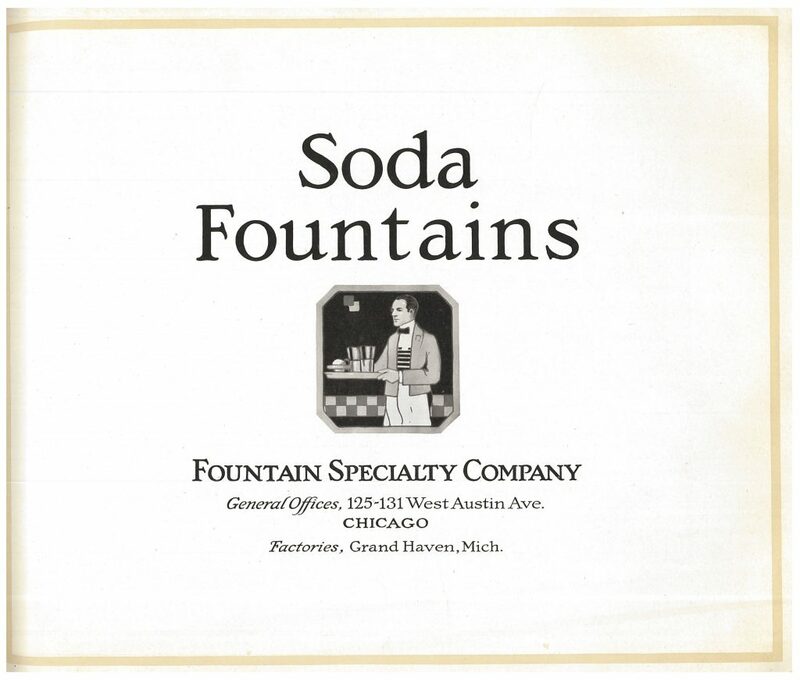 Fountain Specialty Co., Chicago, IL. Soda Fountains, 1920, page 49, Counter Interior No. 833. 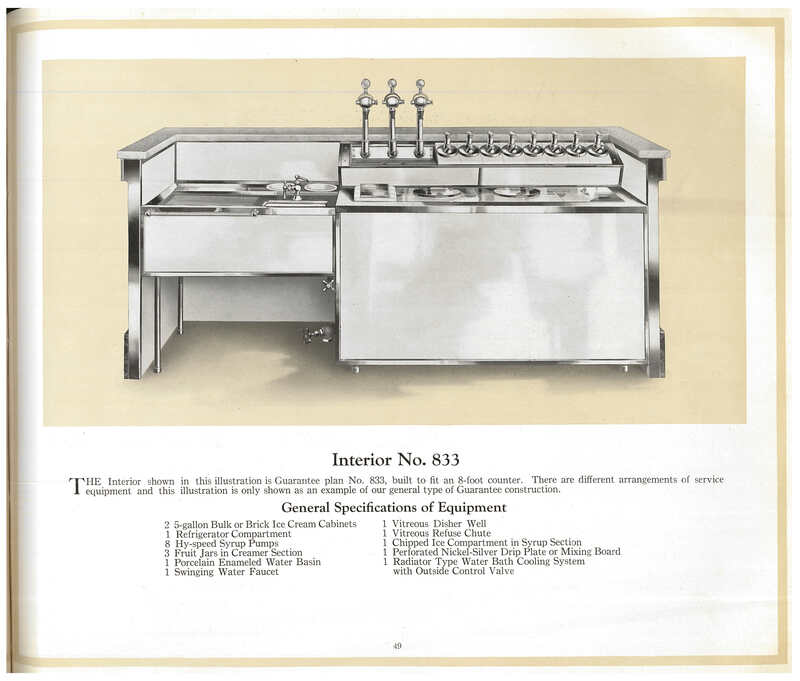 Many more counters, interiors of counters, and backbars are illustrated in this catalog. There are also examples of standard finishes and materials as well as detailed information on specific systems, like the syrup system and cooling systems. Soda Fountains by Fountain Specialty Co. is located in the Trade Literature Collection at the National Museum of American History Library.